Owners Draw - over extended - add personal interest? Being year end I am wondering if I should calculate as a personal expense an interest calculation on an over extension of owners Draw (Sole Proprietor business). I realize the interest on the business credit cards is a business expense but really that interest is inflated because the owner withdrew as a draw more than his income). Whenever the owner withdrew funds from his business line of credit (as a draw) I calculated interest (same as the line of credit %) on that draw as personal interest until he put the funds back. But these draws (totaling $30,000 are from his chequing account & over the course of the year - and he won't be paying it back). So I wonder if I should be doing the same as I do for the line of credit (charging interest on the draws over his net income per month over the last year)? Should I journalize some interest as being personal with regard to the extra $30,000. owners draw? and if so at what interest rate (chequing acct rate or CRA prescribed rate?) Another option might be to set up a loan payable to the owner (but it sole proprietor business). Unlike an incorporated business, a sole proprietorship is not a separate legal entity. There is no separation between the business and the owner. This means, as you probably already know, that all the business income is taxed on their personal income tax return through Schedule T2125. Any business losses can be deducted from their other income. It also means the owner is liable for any debt and/or liabilities incurred by the business. In other words, all of the owner's personal assets are at risk. If the owner has overextended him/herself and removed "business" funds for personal living expenses, s/he is free to do so. It is their money. It would be a different story if the business were incorporated, as there are very specific rules about loans to shareholders. the personal draws is not tax deductible as it was not incurred to earn business income. You didn't say specifically, but I am assuming when you calculated the personal interest component that you made an accounting entry to debit owner's draw and credit interest expense, thereby removing the personal use component. Another concept, that can be confusing to some people, is that net income is not cash flow. The owner could have made a profit that will be taxable, but not have cash to pay the tax owing as s/he did not put any money aside to pay the tax when it is due April 30. 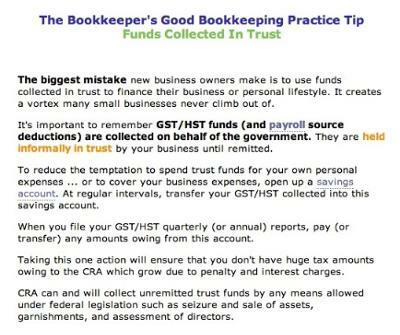 One of the biggest mistakes new business owners make is to spend GST/HST funds and/or payroll source deductions that were collected in trust for the government. It is a big deep hole that is hard to climb out of. So the long and the short of it ... the owner is able to withdraw cash from the business chequing account as a draw with no immediate consequence. You do not calculate interest on these draws. If the owner continues to do this, the business will eventually fail ... how quickly depends on the cash flow coming into the business and whether enough money has been allocated to pay the suppliers' invoices. Hopefully, the owner has established pre-planned priorities for accounts payable payments, and adheres to it. If this business is the owner's only source of income, the owner is living beyond his/her means. When you are doing the books, get paid in advance, and continue to remove the personal use component from any business related expenditures. If government trust funds are being spent and the owner is on an annual filing basis and does not make instalments, recommend that the reporting period be switched to quarterly, so that funds are reported and remitted more frequently and ITCs claimed more regularly, increasing cash flow. Try to get the owner to agree on a set draw that the business can handle ... like a pay cheque. This is difficult to do. Remember Sherrill, try not to take ownership of the client's problems. All you can do is advise them on information/rules you know about and recommend a professional accountant for the rest. I hope this helps. If I just confused you more, post back. I'll take your advice and advise my employer. I shall submit quarterly GST installments rather than yearly. It's great to have confirmation the line of credit entry is right and the chequing acct draws don't have to be input the same way. Thanks for your continual help. Just to clarify, when you are an annual filer and your net tax in a fiscal year is $3,000 or more, you have to make equal quarterly instalment payments in the following fiscal year. Failure to make GST/HST instalments, if required, results in penalties and interest charges. "Your instalment payments that become payable after the first fiscal quarter beginning on or after July 1, 2010, will be equal to the lesser of ¼ of the amount of net tax for the current year and ¼ of 240% of the amount of the net tax for the previous year." As these are instalment payments, you are not claiming ITCs until you file your annual return. If instalments are going to be made, it makes more sense to switch to quarterly reporting so you claim your ITCs throughout the year, thereby improving your cash flow. To change your reporting period, you must submit Form GST20 Election for GST/HST Reporting Period. If a company has for one month personal expenses on their bank statement of 40% and the other percentage or the rest is all business. Do I need to prorate that month's $25 bank charge by 40% as personal and 60% as business? 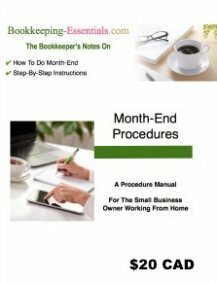 Good bookkeeping requires a certain amount of judgement to apply basic accounting concepts and principles properly. Take time to read about my thoughts on keeping business and personal expenses separate. A big reason you want to track business income and expenses separately is to meet CRA's requirement that you only deduct what is legally allowed. It is very hard to do if income and expenses are not tracked in a separate account. Please make sure you are familiar with thirteen items that are non deductible on Form T2125. One of the items in the article discusses personal expenses. ... if the bank account is a personal account, you could prorate the bank charges, but I wouldn't expense any bank charges to the business. ... if the bank account is in the business's name AND this is NOT a regular occurrence, you could prorate the bank charges, but I woudn't. I'd expense the full amount to the business. 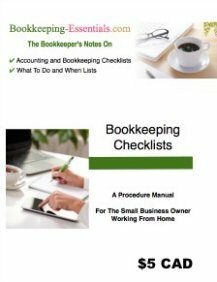 ... if the bank account is in the business's name AND this IS a regular occurrence, you could prorate the bank charges, but I woudn't expense any bank charges to the business although many bookkeepers would take the time to do so. My basic premise is ... if looks like a duck, talks like a duck, and walks like a duck, then it is a duck. Good bookkeeping practices dictates that you get "all your ducks in a row" ... this mean that every business should have a separate business account. I recommend the owner transfer a regular draw to their personal account to cover their personal expenses. This allows them to have money for living expenses ... and keep business and personal expenses separate. Bank account is business bank account used for business and under business name. The 40% personal and 60% happened in one month. Sometimes may just see one item that is personal in one month and maybe 2 in another month and sometimes none at all for whole year. Seems to happen by chance. Owner just sometimes uses company debit card personally if forgets personal card at home and need to buy something. Then I wouldn't prorate the bank charges Martin. I would just make sure all personal expenses are booked to owner's draw (if a sole proprietor) OR shareholder's loan (if incorporated). I'd also suggest it would be better to charge the personal expenses to a credit card rather than use the business debit card. Yikes, it slipped by me to mention that my client also has a credit card for business under the business name too. Would the same concept apply that there would be no proration to service fees on credit cards too if it was accidentally used for personal purchase? This business credit card isn't used too often by owner that's why I forgot to mention it. Martin, if it is infrequent, I'd say no proration ... although with most credit cards there is no interest charge usually unless you don't pay your balance ... or an annual dues. If the business owner used the business credit card on occassion for personal purchases rather than the debit card ... s/he can make a direct payment for the personal purchases from their own personal bank account. You may want to read this forum posting on using the business credit card for personal purchases.